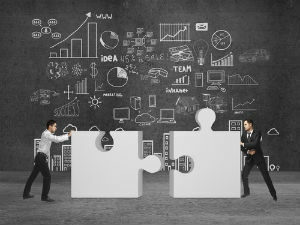 The convergence of digital marketing and public relations has been in motion for many years, but in 2013 and onward, there’s more momentum than ever. Changes in technology and consumer behaviors in how information is discovered, consumed and acted upon has turned brands into publishers and publishers into marketers as they seek new ways to connect with audiences and monetize. Don’t blink during this monumental shift or you’ll be left behind. That’s why it’s important to find trusted sources to guide your point of view to stay ahead in the digital marketing game. One of those sources is David Meerman Scott (@dmscott) – a real pioneer in the integrated search, social media and content marketing space. 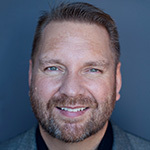 A best-selling author, keynote speaker and digital marketing evangelist, David has been instrumental at communicating and educating marketers on the value of attract and inbound marketing. I’ve known David for quite a while and have interviewed and liveblogged him a number of times. He even took his shirt off for this one – a real promoter. In this interview, David talks about the major changes that have happened in the marketing and PR industry, breaking down organizational content silos and how companies can take advantage of real-time marketing with social media. Bonus: You’ll also find out what David really thinks about Facebook, Snapchat and MySpace. 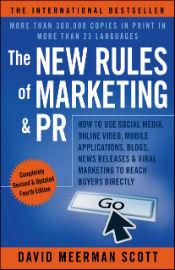 Congratulations on the 4th edition of The New Rules for Marketing and PR. What are some of the major changes in this edition and what does the communications revolution that is happening right now mean for most marketers? Thanks! If you had told me when I was writing the first edition way back in 2005 and 2006 that we would have come this far I’d have said you are nuts. But we have! Imagine, just a few short years ago as I was writing, Facebook was only for students and MySpace had four times as many users. Now MySpace has only 32 million users to Facebook’s 1.1 billion. Twitter didn’t even exist as I was writing the first edition, nor did most social networks we use today. How amazing that in just a few years, the new rules of marketing and public relations has become mainstream! We are truly living through a communications revolution. The new fourth edition of the book builds on the completely revised third edition with another extensive rewrite. I’ve added a brand new chapter on Newsjacking, the technique of injecting your ideas into a breaking news story to generate tons of media coverage. And in the time since I wrote the third edition of the book, marketing using images has exploded. So I’ve added a chapter on highly visual social networks like Pinterest and Instagram, as well as the use of Infographics. Social technologies and consumer behaviors have changed in many ways over the past 4-5 years and that means changes in how companies attract, engage and persuade online. What are some of the most important changes companies can make to adapt and stay relevant on the social web? Consumer behavior has changed in that the way people research products and services now focuses primarily on searching via Google and the other search engines and asking for advice via social networks. Companies need to have their content in front of those consumers at the precise moment they are looking. But that’s great because the Web has liberated us from the tyranny of paying for attention! You can EARN attention online by creating great information that your buyers want to consume such as YouTube videos, blogs, Twitter feeds, photographs, charts, graphs, and ebooks—and it is all free. In one of your blog posts, “PR vs marketing vs social media” it’s suggested that it doesn’t matter who creates the content that consumers discover about your brand, whether it’s marketing or PR. What advice can you share for companies that still operate these functions as silos? Is integration and convergence inevitable in order to succeed? For large brands with robust offline marketing and public relations programs, the two functions – Public Relations and Marketing – should still remain separate. A media relations program is different than an advertising program. 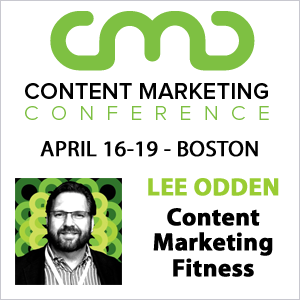 However when large companies operated in the online world and for all smaller organizations that live primarily on the Web and in social media, I think one content creation effort is best. Break down those artificial PR and marketing barriers. A technique like Newsjacking, for example, is a perfect example of something that is in the middle of PR and marketing. For companies that want to take advantage of real time marketing with social media, what advice can you share about getting started? What are some reasonable expectations for outcomes if companies are doing it right? Can you share an example of a company doing it right? It’s all about the real-time mindset. The conventional business approach favors a campaign (note the war metaphor) that requires people to spend weeks or months planning to hit targets. Agencies must be consulted. Messaging strategies must be developed. Advertising space/time must be bought. Conference rooms and refreshments must be prepared for press conferences. Do you serve them sushi or sandwiches? The real-time mind-set recognizes the importance of speed. It is an attitude to business (and to life) that emphasizes moving quickly when the time is right. Developing a real-time mind-set is not an either/or proposition. I’m not saying you should abandon your current business-planning process. Nor do I advocate allowing your team to run off barking at every car that drives by. Focus and collaboration are essential. People frequently say “I work for a big organization” or “I’m in a B2B company” or some other excuse. Heck, if Raytheon can do real-time content creation, so can you! What are some of your favorite tools for social media, content or real time marketing? What about measurement tools? My blog is my best content tool. After nearly a decade and close to 1,000 posts, I get great results from my blog. But I personally love Twitter and Instagram. Those are my real-time tools. What are your favorite social networks: for business? For personal use? Iam agree with all these topics. feeds, photographs, charts, graphs, and ebooks—and it is all free. Social media is a great way of expressing a strategy, but it is not a strategy in and of itself. It’s also a cost, and definitely not free. The labor involved in creating, scheduling and distributing content is very substantial, and the ROI is not always easy to measure. I’m a Comm/PR student @CSUF and this book is required reading in Advanced PR Writing. It’s relevant, up to date and written in a style that is easy for a busy person to read and understand. Agreed! It’s a great book. A great breakdown of how attention gets generated – especially the idea of *earning* attention through the consumption of information, such as photos. Love the book, love the post. But not sure I quite agree that Public Relations is “begging” for attention. That’s certainly NOT how I approach it. I put that firmly in the “earned” column and actually ahead of company-generated media due to the third party credibility of most news media coverage.